A company that pays dividends regularly indicates that it is capable of generating a steady stream of earnings. In a rising stock market where earnings are expected to increase, investors also anticipate that dividend payments may also go up, resulting in an increase in the share price. The dividend that a stock provides relative to its share price is called the dividend yield. As the share price goes up, the dividend yield falls, making the stock less attractive. Despite the recent recovery in the stock market, there are still stocks that have considerably high dividend yields. The current market consolidation shows that many of these high-dividend yielding stocks are trading at relatively low market prices because they have been either overlooked or simply not actively traded by the market. Buying a dividend-paying stock should not only be based on the yield itself, but also on the fundamentals of the company. You need to assess the chances that the company will pay at least the same dividend as last year. Will the company continue to grow its earnings this year? As in any investment, there are always risks that the dividend you may be expecting may be lower next year or the stock price may fall lower than your purchase price because of disappointing earnings results. For example, there is a stock called Abacore Capital (PSE: ABA) that declared that it was paying Php0.20 per share this year, which translates to a high yield of 26 percent. But looking at previous years, the company never paid cash dividends since 2012. Because of inconsistent earnings, there is no assurance that it will have the same yield next year. Another example is DMCI Holdings (PSE:DMC). Based on last year’s dividend of Php0.96 per share at today’s share price, it has a high dividend yield of 8.6 percent. But if you look closer, DMC declared an extra dividend of Php0.48 per share on top of the regular cash dividends that it usually pays. Without the extra dividend, the dividend yield is down to only 4.2 percent. Knowing the dividend track record of the stocks can help you lower your risks of making mistakes. Formely known as Salcon Power Corporation, SPC is in the business of power generation and distribution through its various operating subsidiaries in Iloilo, Naga, Bohol and Cebu. Revenues have been growing by an average of five percent annually for the past six years, which translate to an increase of 11 percent in earnings every year, from Php996 million in 2012 to Php1.6 billion in 2017. The increase in earnings over the years resulted to an increase in dividend payments from Php0.50 per share in 2012 to Php0.80 in 2017. Last year, SPC reported that its nine-month net income grew by 32 percent to Php1.5 billion, which boosted its share price to gain as much as 17 percent this year from Php5.44 last year to its current price of Php6.40. Based on cash dividend payment of Php0.80 per share last year, SPC’s dividend yield at 12.5 percent is still relatively high despite the run-up in the share price. SCC is the largest coal supplier in the Philippines. It supplies power plants, cement plants and other coal requirements of operating boilers. SCC’s annual revenues grew by an average of 11 percent per year from Php24.2 billion in 2012 to Php43.9 billion in 2017. About 55 percent of its revenues come from coal sales while the balance of 45 percent comes from power generation. The growth in SCC’s revenues increased its earnings by an average of 18 percent per year from Php6.3 billion in 2012 to Php14 billion in 2017. In 2018, SCC reported that its nine-month earnings fell by 23 percent from Php11.5 billion the previous year to only Php8.9 billion. This drove its share price to lose by as much as 37 percent from Php36.80 in 2017 to Php23.05 by end of 2018. Lower earnings also prompted the company to cut its cash dividend payments to only Php2.25 per share last year, down by 32 percent from Php3.33 per share the previous year. Despite the lower earnings and cash dividend payments, the stock still enjoys high dividend yield of 10.3 percent. A recovery in earnings this year will not only push share price higher but also its dividend prospects as well. GMA7 is one of the leading broadcasting companies in the Philippines, operating a network of 47 VHF and 41 UHF TV stations, as well as 24 radio stations throughout the country. Earnings of GMA7 have grown by an average of 22 percent per year from Php1.6 billion in 2012 to Php3.6 billion in 2016 on the back of annual revenue growth of eight percent. But in 2017, the company declined by 30 percent to only Php2.5 billion. Last year, GMA7 reported that its nine-month net income continued to fall by 15 percent to Php1.9 billion. Lower income led GM7 to declare lower dividend last year to only Php0.50 per share, down by 28.5 percent from Php0.70 in 2017. Despite the cut in dividends, the stock is trading at a relatively high dividend yield of 8.7 percent. This year, being an election year, income of GMA7 may improve, which can lead to higher share and dividends, too. TEL is the leading telecommunications service provider in the Philippines. The company offers a wide range of telecommunications services across its fiber optic backbone for fixed line and cellular networks. 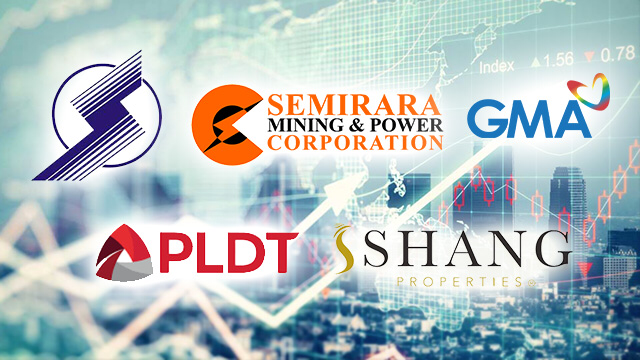 TEL has been constantly growing its revenues for decades being the dominant player in the industry but in 2015, its revenues peaked at Php171 billion with lower income at Php22 billion due to high operating expenses and financing costs. Since then, revenues started to fall in the next two years to Php160 billion in 2017 as net income continued to fall to Php13.4 billion only. Last year, TEL reported that it managed to improve its nine-month revenues by 3.3 percent to Php123 billion, but still failed to lift its income, which declined by 26 percent to Php16.2 billion. TEL has been a consistent dividend payer for years but because its income had been shrinking, its dividends had been falling, too. In 2015, TEL’s cash dividends was cut by 17.8 percent from Php185 per share to Php152. This continued to fall by 30 percent in 2016 at Php106 per share. In 2017, cash dividends were further cut by 28 percent to Php76 per share and last year, dividends fell further by 16 percent to only Php64 per share. The fall in dividends mirrored the fall in the share price of TEL, which lost 61 percent in value from Php2,906 in 2015 to the current share price. Although dividend yield is relatively high at 6.2 percent, there is no assurance that TEL will pay the same cash dividends this year given the strong historical downward trend of its earnings and dividend in the past years. SHNG is in the business of residential development and leasing of upscale office and retail properties. SHNG owns 71,101 square meters of property at the heart of Ortigas Center, a portion of which is leased to its wholly owned subsidiary, Shangri-La Plaza and affiliate, Edsa Shangri-La Hotel. The company also recently opened the Shangri-La at the Fort in Bonifacio Global City, which features mixed use of hotel and luxury residential condominiums. SHNG’s earnings have grown by an average of 16 percent per year from Php1.6 billion in 2012 to Php3.3 billion in 2017. Last year, the company reported that its nine-month earnings declined by 15 percent from Php2.2 billion in 2017 to Php1.9 billion. Because of expected lower 2018 earnings, SHNG declared this year that it will pay cash dividend per share of Php0.1055 per share, 16 percent lower from Php0.1255 per share the previous year. This makes the estimated total cash dividend for the year to be lower at Php0.163, making current dividend yield at 5.2 percent. How Many Filipino Women Have We Elected into Public Office?